Home » Science » Is the 5 Second Rule for Dropping Food on the Floor Legitimate ? But is it actually okay? There are also other variations on timing (10 second rule, 20 second rule, etc. ), the general premise of this folklore is that your food won’t be contaminated by bacteria within a given time frame. To analyze whether or not this is true, we need to understand the risks of contamination in the first place. 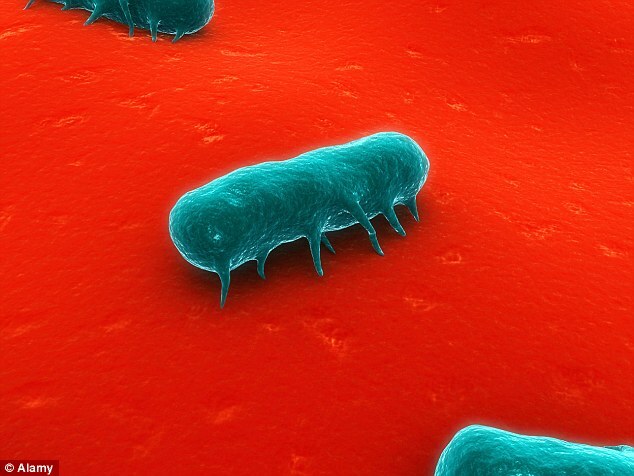 One of the most harmful bacteria potentially present in our homes is Salmonella typhimurium. This rather nasty little strain of salmonella is found in the digestive tracts and faeces of animals all over the world and can potentially end up in our food. This bacteria can get ingested through raw or undercooked food, and when present in large enough numbers can cause sickness. Even though the acid in your stomach will kill many bacteria, those that survive move on to the small intestine and begin to multiply, causing inflammation, which leads to cramps, diarrhea, and vomiting. While you may not be ingesting undercooked food directly, Salmonella typhimurium can live up to 4 weeks on dry surfaces in your house. Similar survival rates can be found in other bacteria, providing studies with some interesting results. A study testing the 5 second rule was done by dropping bologna onto 3 different surfaces contaminated with Salmonella typhimurium: tile, carpet, and wood. When the bologna was dropped onto tile, nearly 99% of the bacteria was transferred in 5 seconds. When it was dropped onto the wooden surface a more varied amount was transferred (5%-68%). Another study found that wet food, such as pastrami, picked up much more bacteria from the surface when compared to dry food such as saltine crackers. These results remained consistent in tests using 2 seconds and six seconds, suggesting that it was not the amount of time that was most important but rather how wet the food was. Finally, using a college campus to represent an “everyday environment.” researchers dropped apple slices and Skittles in various dining locations to see how long it took the food to be contaminated with salmonella. Surprisingly, the results showed that no salmonella was transferred to the dropped food, regardless of whether it was left on the ground for 5, 10, or even 30 seconds. This suggests that salmonella was rarely present on the surfaces in these public spaces. Having said that, other studies have looked less specifically at one strain of bacteria and found contamination after only 2 seconds of contact. 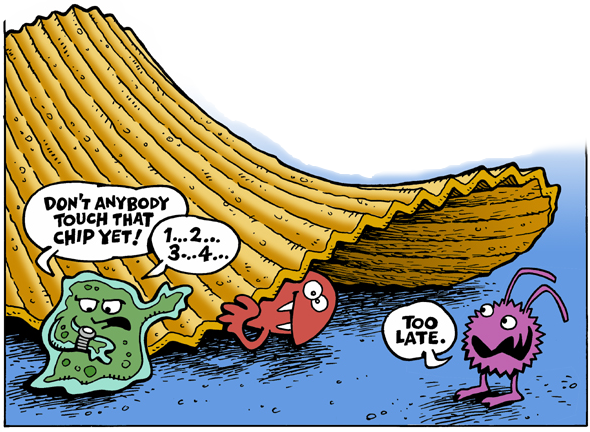 So the 5 second rule depends on many variables! It really comes down to which bacteria are present to begin with, what food you are dropping (its wetness), and which type of surface it’s falling onto. 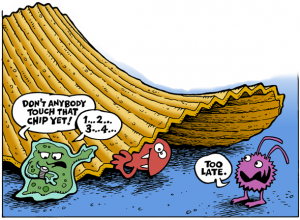 Simply put, the five-second rule can be thrown out the window with regard to contamination as bacteria will cover your food in fractions of a second. But whether or not you will get sick depends on a variety of factors.